The Columbia River TSR Terzuola Survival Rescue is a tough fixed blade outdoor knife, but it is also a lot more than that. Its non-slip textured glass-reinforced nylon handle scales can be removed, revealing a hollow storage space that contains fishing hooks, line and paracord. Holes bored through the handle and the base of the blade allow it to be used as the head of a hunting spear. Its injection-molded sheath is equally versatile. 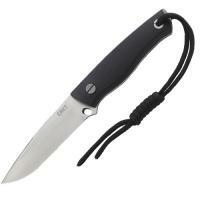 It comes wrapped in paracord, and includes a magnesium firestarter, a ceramic blade sharpener and a reflective steel plate for signalling. The blade is a versatile plain edged drop point, with a sharp piercing tip and a long cutting edge for slicing. 6 Point Star Badge - B667 - 2 1/4" x 2 1/4"